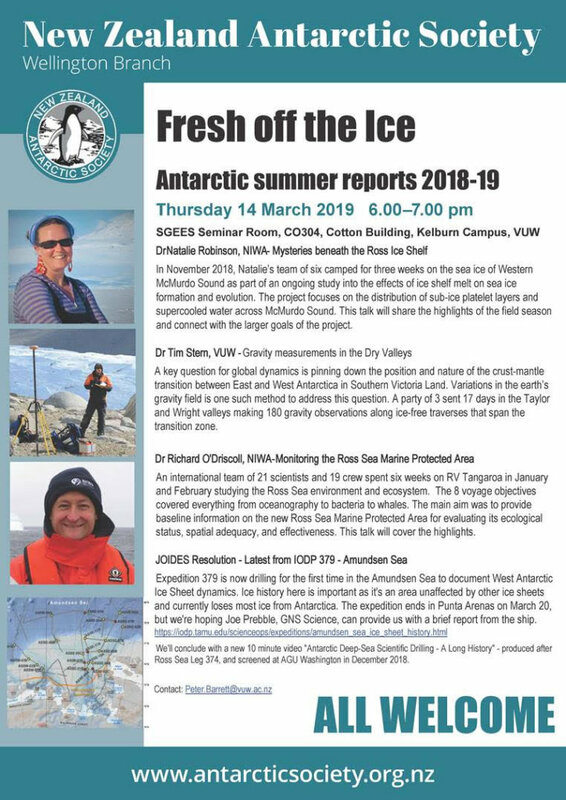 This is our first Wellington-based event of the year, with four talks from last season’s research on sea ice formation, the crustal transition between East and West Antarctica, in support of the new Ross Sea Marine Protected Area, and first deep-sea drilling in the Amundsen Sea region of West Antarctica. We’ll conclude with a 10 minute overview of Antarctic drilling produced after last year’s Ross Sea drilling. It’s also a chance to find out what your Wellington Branch Committee has planned for the year, and what’s going on nationally.Looking forward to seeing you again. In November 2018, Natalie’s team of six camped for three weeks on the sea ice of Western McMurdo Sound as part of an ongoing study into the effects of ice shelf melt on sea ice formation and evolution. The project focuses on the distribution of sub-ice platelet layers and supercooled water across McMurdo Sound. This talk will share the highlights of the field season and connect with the larger goals of the project. A key question for global dynamics is pinning down the position and nature of the crust-mantle transition between East and West Antarctica in Southern Victoria Land. Variations in the earth’s gravity field is one such method to address this question. A party of 3 sent 17 days in the Taylor and Wright valleys making 180 gravity observations along ice-free traverses that span the transition zone. to provide baseline information on the new Ross Sea Marine Protected Area for evaluating its ecological status, spatial adequacy, and effectiveness. This talk will cover the highlights. largest ice loss in Antarctica. The expedition ends in Punta Arenas on March 20, but Joe Prebble, GNS Science, will provide us with a brief report from the ship.